An electronic kit is a package of electrical components & PCB (printed circuit board) which are used to build a working electronic device. Usually, kits are composed of electronic components, a circuit diagram (schematic), assembly instructions and often a printed circuit board (PCB) or another type of prototyping board. There are 2 distinct types of kits, those that will construct a single project, and those that can construct a range of projects. The latter are primarily aimed at children, and include a solderless construction board known as a breadboards into which component leads are inserted, following documentation of the “kit”. The first type of kits, those for the construction of a single device, normally use a PCB on which components are soldered. They normally come with extended documentation describing which component goes where into the PCB. People primarily purchase electronic kits to have fun and learn how electronic stuff work. They were once popular as a means to reduce the cost of buying goods, but there is usually no cost saving in buying a kit today. In earlier days, entire televisions and radios used to be sold as kits requiring highly skillful soldering & assembly. Many of the early microprocessor computers were sold as either electronic kits or assembled and tested. Heathkit sold millions of electronic kits during its 45-year history. Today, building devices from scratch for hobbyists and beginners has fallen in popularity due partly to the emerging complexity of miniature electronics and embedded software. People still build custom devices and special-purpose electronics for professional and educational use, and as a hobby. Also emerging is a trend to simplify the complexity by providing preprogrammed or modular kits and this is provided by many suppliers online often. 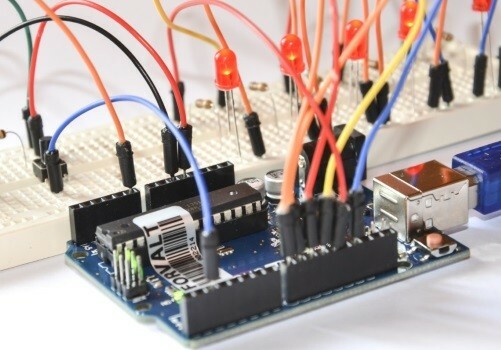 The fun and thrill of making your own electronics has shifted in many cases from easy to comprehend application and analog devices to more sophisticated and digital devices. Proceed to the Electronic kits and circuits page. Where can I buy Electronic kits?